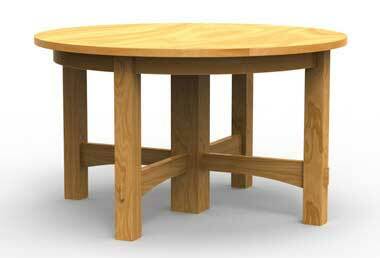 Click here for detailed round dining table plans. 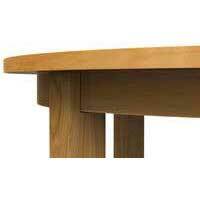 This extension table should be made of some hard wood, preferably white oak. It will be a difficult matter to secure legs of the sizes indicated in solid pieces of clear stock. It will be possible, however,  to secure them veneered upon white-pine cores. If the veneering is properly done these will serve the purpose very well, the lighter weight, due to the white-pine core, being an advantage. The circular facing is best made by first sawing a segment of the circle of the size wanted and then veneering the outer surface of this. 4 legs, 3 by 3 by 30-1/2 in., S-4-S.
1 leg, 5 by 5 by 30-1/2 in., S-4-S.
4 rails, 1-1/8 by 5 by 23 in., S-2-S.
4 facing segments, 1-1/8 by 3-1/4 in. on a 24-in. radius. 3 extra boards, 1-1/8 by 12 by 55 in., S-2-S.
4 slides, 1-1/8 by 2-3/4 by 36-1/2 in., S-4-S, maple. 2 slides, 1-1/4 by 2-3/4 by 36-1/2 in., S-4-S, maple. 4 frame pieces, 7/8 by 3 by 9 in., S-4-S, maple. 2 frame pieces, 7/8 by 6 by 28 in., S-4-S, maple. 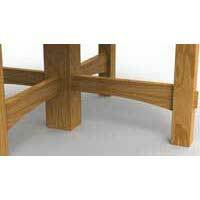 2 frame pieces, 7/8 by 4 by 23-1/2 in., S-4-S, maple. You will need to purchase a set of slides. There are various ways of arranging the slides to work one with the other. Prepare the legs by cutting them to length. Lay out and work the mortises. The ends of the facings are to be tenoned and housed into the posts. Prepare the rails by cutting the tenons and shaping the lower edges as shown in the drawing. Prepare the top. After this, assemble this much of the frame, using plenty of clamps and good hot glue. Next get the under frame and the slides ready and attach them as shown. There will be needed plenty of glue blocks for reinforcing the facing where it is fastened to the top, etc. For a finish, apply a filler colored, as desired. Upon this, after it has hardened and been sanded with No. 00 paper, apply a coat of shellac. Upon the shellac apply successively several coats of some good rubbing varnish. Rub the first coats with haircloth and the final coat with pulverized pumice and crude or linseed oil. If an effect is wanted that will contrast, stain the wood first with a water stain. Sand this lightly when dry, then apply a second coat of stain diluted one-half with water. Again sand and then apply a thin coat of shellac. Sand this lightly, and apply the filler and the varnish as described above.